Need to drink fruit juices as part of your fitness regime? Then get this Cleo juicer mixer grinder from Maharaja Whiteline and make fresh juices at home. This appliance can also be used for mixing and juicing, making it a multi-purpose appliance in your kitchen. Functions The main unit comes with a 1.5L liquidizing jar and a 0.7L multi-purpose jar for the wet grinding, dry grinding, chutney grinding, liquidizing and juicing needs in your kitchen. Maximum juice extraction This juicer mixer grinder is equipped to extract maximum juice from fruits so that nothing goes waste. Stainless steel juicer mesh The stainless juicer mesh filters will provide pulp-less fruit juices by filtering the pulp while juicing. Super sharp blades Equipped with super sharp blades, this juicer mixer grinder will complete your mixing and grinding needs within no time. Need to drink fruit juices as part of your fitness regime? 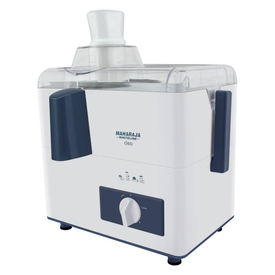 Then get this Cleo juicer mixer grinder from Maharaja Whiteline and make fresh juices at home. This appliance can also be used for mixing and juicing, making it a multi-purpose appliance in your kitchen. Functions The main unit comes with a 1.5L liquidizing jar and a 0.7L multi-purpose jar for the wet grinding, dry grinding, chutney grinding, liquidizing and juicing needs in your kitchen. Maximum juice extraction This juicer mixer grinder is equipped to extract maximum juice from fruits so that nothing goes waste. Stainless steel juicer mesh The stainless juicer mesh filters will provide pulp-less fruit juices by filtering the pulp while juicing. Super sharp blades Equipped with super sharp blades, this juicer mixer grinder will complete your mixing and grinding needs within no time.